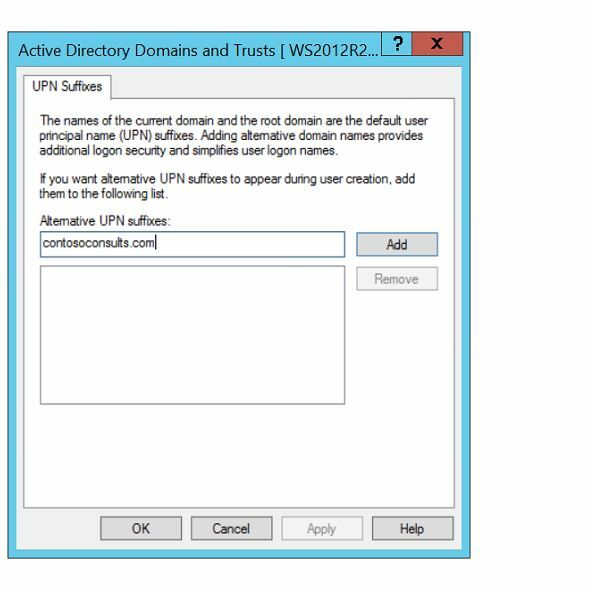 Create a UPN Suffix using PowerShell for Office 365 Migration. | Chinny Chukwudozie, Cloud Solutions. ← Raising Active Directory Forest and Domain Functional Levels Using PowerShell. Create a UPN Suffix using PowerShell for Office 365 Migration. In the user logon name field, select the new upn, change the name from TobeGray to Tobe.Gray and click ok. The user’s logon token will be populated with the new upn property and resolve any outlook authentication errors that might occur due to a logon name and email address mismatch after mailbox migration to Office 365 tenant. 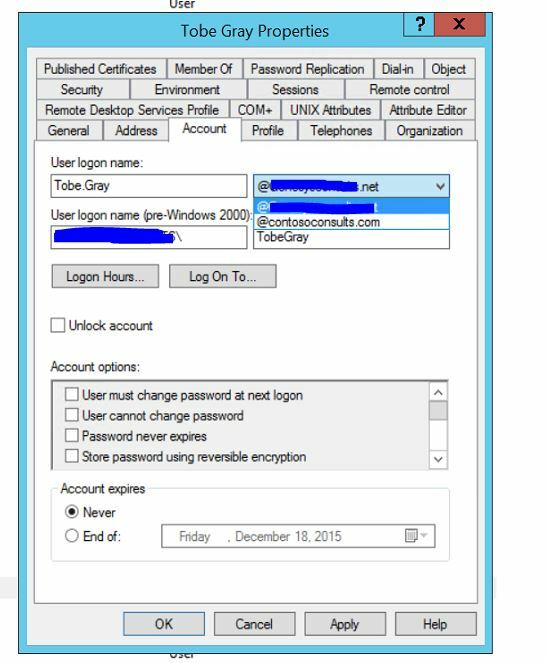 This entry was posted in Active Directory, Active Directory Domain Services, Azure Windows PowerShell, Office 365, PowerShell, PowerShell 3.0, Powershell 4.0 and tagged Domain controller, Domain Name, Email Address, Office 365 Migration, On Premise Logon, Outlook Authentication Issues. Bookmark the permalink. 4 Responses to Create a UPN Suffix using PowerShell for Office 365 Migration. You’re welcome dude. Thank you. I get html formatted output, but the command/content of what I copied is missing. I’m copying from the editor pane in ISE. Any idea?